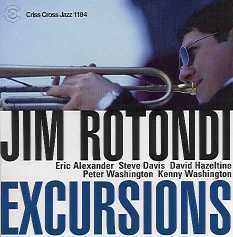 Surrounded by his colleages from the notorious sextet collective One For All , Jim Rotondi on Excursions etches the qualities that have won him numerous admirors in recent years as a featured soloist with Lionel Hampton, Charles Earland and - more recently - Kyle Eastwood. Projecting one of the most beautiful sounds in jazz, he plays with staunch confidence, nuanced maturity and intuitive melodicism - and reaffirms his charter membership in the no-holds-barred society of improvisors. 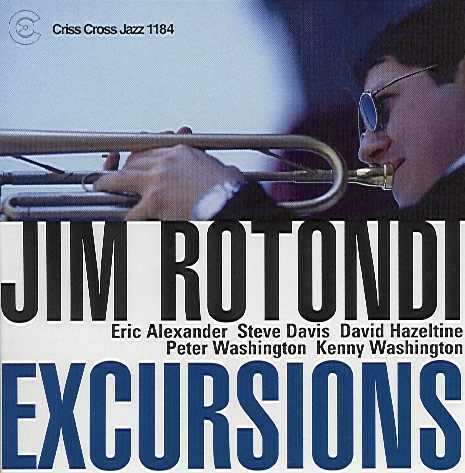 The Band: tenor saxophonist Eric Alexander, trombonist Steve Davis, pianist David Hazeltine with Peter Washington on bass and Kenny Washington on drums.